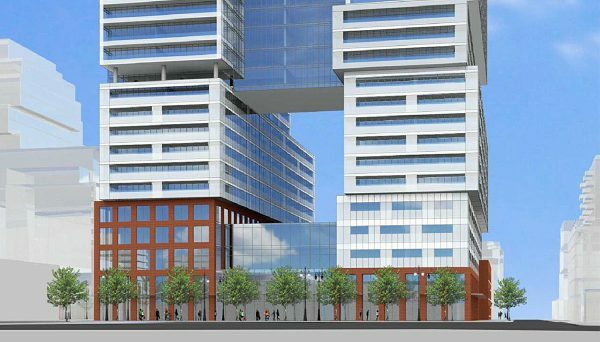 This new project is 32-storey condominium in the pre-construction phase proposed for the St. Lawrence Market neighbourhood. 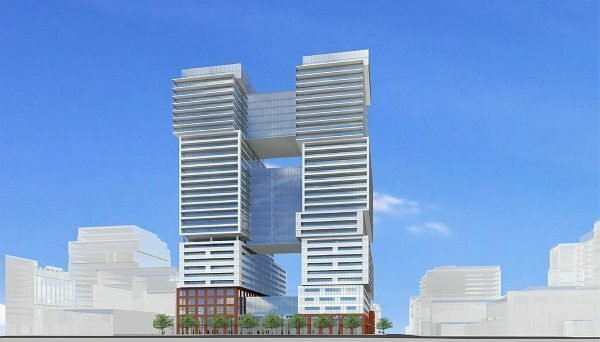 Comprising two modern towers above a podium, 254 King Street East Condos has an occupancy date scheduled for 2021. This project occupies a city block bound by King Street East, Ontario Street, Princess Street and King Street East, adjacent to Toronto’s downtown core. The site currently houses three heritage buildings, which are proposed to be restored and incorporated into a five-storey base. The two towers, anchored by the base, will rise 32 storeys each, with bridge-style connections between the 12th and 21st floors and again from the 25th to 31st. The unit mix for the project at 254 King Street East will is expected to consist of 90 bachelor suites, 439 one-bedroom, 330 two-bedroom and 79 three-bedroom suites, for a total of 938 units. A somewhat unique feature of this building is the series of outdoor amenity terraces proposed, occupying the south-facing rooftops of the 2nd, 4th, 11th, 14th, 21st and 23rd floors, including the “bridge” elements. Indoor amenity space will be included on the 3rd, 4th, 5th and 12th floors, with connections to the outdoor terraces on each level. A public park is also proposed for the northwest corner of King and Ontario streets. The streetscape of King Street will be highlighted by the restored heritage buildings, which will contain 37,700 square-feet of retail and commercial space spread over the first and second floors. The first two floors fronting Adelaide – on the north portion of the site – will feature community space, the exact use to be determined at a later date. 188 parking spaces will be included in an underground garage, along with 940 bike spaces and a dedicated bicycle elevator. Condos in the St. Lawrence Market neighbourhood have access to everything downtown Toronto has to offer. The market itself, one of the area’s landmarks, is a historic icon that features a variety of programs and vendors, from local produce to exotic imports and artisan crafts. Much of the neighbourhood surrounding the market has been built up recently, including the historic Market Street, which now features cobblestone sidewalks and a selection of trendy boutiques and cafes. Several developments have either been recently constructed or are in the preconstruction phase for the nearby area, from newly-built soft loft buildings to projects that combine historic facades with contemporary additions. It’s an exciting place to be a part of, where design showrooms, bars and trendy cafes line the stretch. We’ve seen a lot of industries securing contemporary office space in the area too, from design and tech firms to law offices and creative collectives. The streetcar is at your door and commuting into the city’s Financial District takes only minutes, making it a popular hub for professionals who want a simple commute to work. George Brown College is right down the street, and Ryerson University is a few minutes away. Whether you’re looking for an income property or a place to set down roots of your own, the St. Lawrence Market neighbourhood is a gem, poised for a trendy, urban transformation.